Ken Dodd's career as a comedian began with the advent of television but his act still owed a lot to the traditional stand-up stuff prevalent in the old variety theatre. This meant that he was expected to sing as he neared the end of his act, thus allowing his audience to wind down from the pace of his comic antics. Fortunately, Ken had quite a good voice and his renditions of romantic ballads were good enough for him to be given the opportunity to record. So in 1960 his entry into the UK chart came as no surprise, but his transformation into a romantic balladeer was nevertheless a significant achievement for a buck-toothed comedian. The EP shown on the right was released while Ken Dodd was probably at the highest point of his lengthy recording career and no doubt well worth the ten shillings and eleven pence asked for it by his many fans. It was recorded in the company of the Geoff Love orchestra- a band that backed many singers of the time and who would have instrumental success in their own right a few years later. His first single was no 'flash in the pan'. 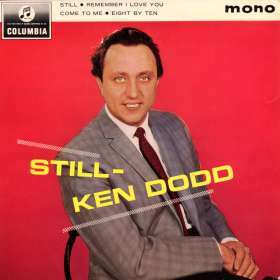 In fact Ken Dodd's success in the 1960s makes a mockery of the claims of many critics and music writers who hold the erroneous- though often quoted- belief that all the old singers were swept away by the Beatles and those in the vanguard of Britain's beat boom. In fact Ken's 1965 hit 'Tears' spent four weeks at #1, longer than the Beatles, The Hollies or the Rolling Stones could manage at about the same time. Not only that, Dodd's pop chart career ran for more than 10 years, a feat few beat groups can match.